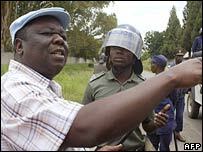 Zimbabwe's opposition leader Morgan Tsvangirai was among scores of activists severely assaulted in police custody in March. President Robert Mugabe, who wants to contest elections due next year, says they "deserved" their treatment. What is life like in Zimbabwe? Pretty terrible for most people. Many factories and other employers have closed as the economy has gone from bad to worse. Most of the population is trying to feed itself by growing food but the rains have not been good and hundreds of thousands are going hungry. Prices are rising by the day. Zimbabwe's annual inflation rate is 3,700% - the highest in the world. Basic items such as bread, sugar, petrol are often not available in local shops. Just about the only thing that all sides agree on in Zimbabwe is that land is at the heart of the problems. The opposition says that Mr Mugabe's seizure of most white-owned farms since 2000 has wrecked what was once one of Africa's most developed economies. 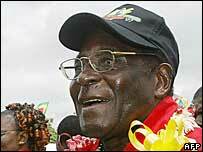 Mr Mugabe says the redistribution was needed to make land ownership more equitable following the colonial era. He says that western powers have sabotaged Zimbabwe's economy because they want to drive him from power. So is Mr Mugabe in trouble? Some say it could be the beginning of the end - but that has been said many times in recent years. It is possible that Mr Mugabe's position has been weakened by his bid to stay on - those in his Zanu-PF party who wish to succeed him may be getting impatient. His original plan was to change the constitution to postpone elections until 2010 but this idea was last December blocked by his party - a rare event. Equally, some say the collapse in living standards is now affecting the soldiers and police officers who have been the bedrock of his support. If they refused to carry out orders to fire at protesters, the fear factor would be removed, boosting the opposition campaign against him. But Zimbabwe's economy has been in decline for several years - it is difficult to predict when the tipping point will come. There was speculation that Mr Mugabe would come under strong pressure from his neighbours and even his party after the attacks on Mr Tsvangirai and the others but, as on several previous occasions, he has shown himself to be a wily politician and emerged unscathed. Mr Tsvangirai's Movement for Democratic Change was formed in 1999 to oust Mr Mugabe but has so far failed to achieve that goal. They complain that elections have been rigged and their activists beaten and even killed but from a political point of view, Mr Mugabe seems to have outsmarted them so far. Two years ago, it split into two factions, making Mr Mugabe's life much easier. The two factions have recently showed signs of coming together. That could be why the police took such tough action to break up the rally and arrest Mr Tsvangirai and several of his colleagues. Following disputed elections, the US and the EU imposed targeted sanctions on Mr Mugabe and his close associates - they are banned from travelling and any assets they hold have been seized. But African countries have been reluctant to openly criticise Mr Mugabe, who is widely respected as a hero of the fight against colonial rule. Despite strong pressure, Zimbabwe's big neighbour, South Africa, has been reluctant to get involved, instead pursuing a policy they call "quiet diplomacy". However, the government is understood to be particularly alarmed at plans to delay elections until 2010 - as this would coincide with South Africa's hosting of the World Cup. Mr Mugabe has also moved closer to China, which is happy to continue business ties without lecturing about human rights and democracy. Would Mugabe agree to step down? He would have little choice if the Zanu-PF leadership united to tell him it would be better if he left - the party is not a one-man show. But he may be worried about a possible prosecution if he was no longer head of state. Mr Tsvangirai has repeatedly promised that Mr Mugabe would enjoy an "honourable exit" as the founding father of Zimbabwe. But some of those who have suffered at the hands of his security agents would no doubt be tempted to take him to court. One option may be for him to got to exile in Angola or Namibia, which have always remained his close allies.